Someone must have pulled the right lever, as classic adventure game Myst will see a 3DS release in March. Not content with being available on almost every other platform in existence, one of the most popular adventure games of all time is on its way to the 3DS. 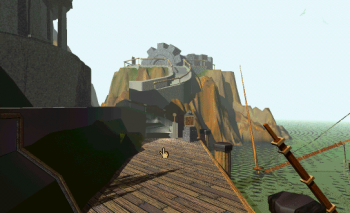 Myst is one of those games that just many people played, but few have made it past the first level, much less beaten. In March 2012, gamers will get a second (or third, or fourth, or hundredth) chance to point, click, and puzzle their way through the enigmatic island of Myst, but this time, in full autostereoscopic 3D. The new port, Myst 3D, comes by way of Hoplite Research, which developed the DS and PSP ports of Myst, and Maximum Family Games, which specializes in family-friendly games across a variety of platforms. Except for the 3D effects, the game will not include any new content. However, series fans will be pleased to know that the icy Rime Age, originally developed for the realMYST remake, will make an appearance. The Age itself does not add considerable playtime to the game, although it does offer a tantalizing puzzle that segues nicely into Riven, Myst's first sequel. The whole Myst series has been in a weird state of limbo ever since the release of Myst V: End of Ages. While it's played around with frequent re-releases and repeated attempts at a cooperative online game, the series seems to be at a standstill. Myst gets ported with almost clockwork regularity, and now Riven has joined the fray. In comparison, the developers have done very little with Exile, Revelation, or End of Ages, the next three sequels. Regardless of the overall plan for the series, the 3DS port of Myst will likely entice some newcomers and give some older fans a nostalgia trip. Whether the future of the Myst lies solely in re-releasing one or two games for every new platform, however, is a mystery worthy of the puzzling franchise.